We’d love your help. 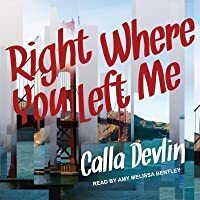 Let us know what’s wrong with this preview of Right Where You Left Me by Calla Devlin. In search of the perfect story to put a human face on a tragedy for his newspaper, my dad will fly into the eye of the storm. And now he’s heading to Ukraine, straight into the aftermath of a deadly earthquake. I don’t want him to leave. I don’t want to spend the week alone in a silent house with my mother, whose classically Russian reserve has built a wall between us that In search of the perfect story to put a human face on a tragedy for his newspaper, my dad will fly into the eye of the storm. And now he’s heading to Ukraine, straight into the aftermath of a deadly earthquake. I don’t want him to leave. I don’t want to spend the week alone in a silent house with my mother, whose classically Russian reserve has built a wall between us that neither of us knows how to tear down. But I don’t tell him this. I don’t say stay. To ask other readers questions about Right Where You Left Me, please sign up. 'Right Where You Left Me' is the story of Charlotte. Her mother is a Russian immigrate who works in the bakery downstairs from their apartment. Charlotte's father is a larger than life newspaper reporter who loves to be the first on the ground during natural disasters. At the very begging of 'Right Where You Left Me', Charlotte's father leaves for Ukraine to cover an earthquake. Her father soon becomes missing. Charlotte's shared experience with her mother of worrying about Charlotte's father draws them both closer together and further apart. I began reading 'Right Where You Left Me' the day before hurricane Irma hit here in Florida. It was an interesting surprise to find out that this story was about someone who covered natural disasters. I loved that this was a fresh topic that hasn't been touched on much in YA. I think how a family reacts when a member is missing in a faraway place is a very interesting premise to explore. Some of the great elements of this story that I really enjoyed was the details about the baking. I also thought an important topic that is explored is that Charlotte has to deal with competing with her dead sister. My absolute favorite part was the few Russian folk tales that are peppered throughout the book. These were fresh stories that I never heard before. They made me want to read more east european tales. These folktales also helped to give an inside look into the state of Charlotte's mind. Now for the elements that didn't work for me. With the exception of Charlotte's mother I really didn't connect with any of characters. I just felt that were kind of flat and I really didn't get a sense of who they were. For some reason I really didn't like any of Charlotte's friends (or the jerky FBI guy). I also felt like they were too involved in the story and just seemed like they were constantly mentioned. I also wasn't crazy about all the photography stuff. I feel like half of the YA books I've read lately have inspiring photographers as characters and I just find the photography details to be boring. Finally, I felt like this should have been a short story and not a novel. It seemed so long for a 247 page book. All the action was at the beginning and at the end. The middle was just filled with the fluffy details of Charlotte's everyday routines. 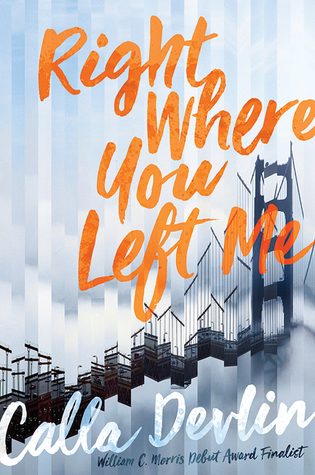 My final judgement is that despite being problematic in many areas, 'Right Where You Left Me' is a culturally rich and ethnically diverse novel with a unique premise. The storyline is timely and relevant in today's world and worth a read. Last year, I loved Tell Me Something Real and enjoyed visiting with Calla when she launched here. When I learned she was writing a book set in San Francisco, I knew I had to read it! “I’ll be here,” I say. “Right where you left me.” He kisses my cheek. I tell him I love him. Calla Devlin shall hereby be crowned as queen of writing family dynamics. Right Where You Left Me is a stunning follow up after Tell Me Something Real and is a treat for fans of Jeff Zentner and Jandy Nelson. This is one of tho Last year, I loved Tell Me Something Real and enjoyed visiting with Calla when she launched here. When I learned she was writing a book set in San Francisco, I knew I had to read it! This is one of those rare books where the plot and characters play an equal role in why I loved it so my. Generally I am a character driven reader but Calla manages to make me care about what's going on around them as much as I do the people. Charlotte, our main character, is so tangible that I felt I could see her in the pages. Charlotte's dad is a journalist and heads into dangerous territory to cover stories. This time he's in the Ukraine, where he doesn't come right back from. Charlotte and her father are very close, a polar dynamic from her mother and relationships with many of her peers. But we all know experiences change people and their support networks. This book is less about rescuing her father and more about rescuing Charlotte from the rocky relationships she has. Why do terrible and wonderful things occur at the same time? Given the context and severity of her father's capture, Right Where You Left Me has the potential to be absolutely heartbreaking. I won't share the ending but the one thing I can say is that Charlotte's journey through the book makes it worth the journey of losing her father. There's certainly some adventure in the story, given that Charlotte goes on her own search to figure out where her father is, both helping and muddying the investigation (but someone has to get stuff done!). You know it's not safe but you can't help but cheer for her. Morris Award Finalist Calla Devlin returns with her second novel, Right Where You Left Me, and delivers a story of intrigue, rescue, and redemption. Protagonist Charlotte showcases what Devlin does best: smart, complex, multi-dimensional young women, paired with a smart and complex storyline. Charlotte's tumultuous relationships with her mother and her peers--set against the drama of her missing journalist father--will surely grab YA readers. Please Note: I received and advance reader's copy of this book in exchange for an honest review. This did not influence the opinions of my review in any way. About a year ago, I had the great pleasure of reading Calla Devlin's first novel, Tell Me Something Real. It was an emotional roller-coaster of a book! I loved it. So when the publisher offered an advance reader's copy of the author's next book, Right Where You Left Me, I couldn't resist. Although these books very different, they both explore Please Note: I received and advance reader's copy of this book in exchange for an honest review. This did not influence the opinions of my review in any way. Although these books very different, they both explore the complicated relationship between mothers and daughters. With foggy San Francisco as a backdrop, the compelling story of Charlotte's missing father pushes her to confront her challenging relationship with her mom. If her dad doesn't come home, can Charlotte and her mom continue as a family? The sense of impending doom is palatable. Okay, I am very biased here. I live in the San Francisco Bay Area, so any book set here is one I will be partial to. But the author's descriptions of specific neighborhoods are so vivid, I must assume that she has lived in San Francisco at some point in her life. There is simply too much love in her descriptions to have been made up. Now I want to revisit the areas Calla Devlin has placed the story, walk the streets, and fall in love with San Francisco all over again! The Russian bakery items that Charlotte's mom, Valentina, makes are prominently featured as part of this book! The descriptions of bird's milk cake, rogaliki, and Tulskie prianiki are mouth-watering! I thought making sharlotka the dessert that she associates with Josh (her crush) to be so clever because of how Charlotte and sharlotka sound so similar. Charlotte and her mom, Valentina, are both complex characters. Valentina is distant and is not very affectionate with her daughter, making Charlotte feel isolated and unloved. At first, I thought she was a little bratty for feeling this way, but as the book slowly unfolded, we begin to understand why Charlotte feels this way. Charlotte is also very conflicted about many aspect of her life. She is attracted to Josh, but knows her friends don't approve of him. She also thought she wanted to be a journalist, like her dad. But she is also drawn to photography and art. Can she disappoint her dad (if he ever returns), given what he has gone through? Valentina is Russian and immigrated to the United States when she married Charlotte's dad, Jeremiah. Although it seems like they are living a happy life, tragedy lurks in the corners. Their first child, Lena, died as an infant, and when Charlotte was born, Valentina suffered a stroke. Does her mom blame Charlotte for causing her stroke? Does she resent that Charlotte is alive while Lena isn't? There is so much misunderstanding on both sides. It is rather heart-breaking, yet I get how people's perceptions can cause a rift in a relationship. No matter how much I list the many reasons he's probably safe, my anxiety builds. Something's wrong. I know it. When disasters happen, reporters go out to document the event. This is an infallible truth for Charlotte Lang, whose father is one of those reporters. Every time he leaves, she worries for him, and struggles with the thought of staying alone with her mother for an extended period of time. Then there is a devastating earthquake in Ukraine, and her father packs up and heads out. Like always, Charlotte worries about him. The days pass without any contact with him, and Charlotte is heartbroken to discover that her father has officially been declared missing. Then the FBI shows up with more bad news. Charlotte would do anything to get her father back, but is there anything she can even do? Right Where You Left Me is an extremely short novel detailing the coming-of-age story of Charlotte, who is struggling with what she wants from the future, as well as a strained relationship with her mother, a Russian immigrant. It was an extremely quick read, but I just didn't connect with it as much as I wanted to, so I'm giving it 2 stars. I didn't really connect with any of these characters. I felt that they were all pretty one-dimensional, from our narrator, Charlotte, to her mother and her friends. Charlotte's anxiety and grief over her father being declared missing is understandable, but it didn't really hit me emotionally. The same can be said for her relationship with her mother, a relationship that she feels is strained and distant, stemming mostly from the death of her older sister before Charlotte was even born. "I think things might be changing with my mom, though. She's talking to me more. That's good." When she's not focused on her issues with her mother, Charlotte is having an internal crisis over what she wants for her future. She loves photography and has always said that she is going to follow in her father's footsteps and be a journalist. But deep down inside she knows it's not what she loves best. But with Dad gone, I can't do anything besides photojournalism. I want to be like Dad. I need to be like him. He's strong and smart and has a lightness that lifts up everyone around him. If I'm not like him, then I'm like Mom, fragile and afraid. I think what I took issue with in this coming-of-age story is that Charlotte is the one standing in her own way. She looks down on her mom because of what she perceives their relationship to be like, but she never makes an effort to discuss things with her mom, nor understand her. She's having a crisis about what college to go to and what to study when she gets there, but it's not because her parents are pushing her for one thing while she wants another, it's because she's stubbornly holding onto something she knows she doesn't love. And I think this book could've done without the mild romance. It's just another fruitless, emotionless relationship for Charlotte. Apparently she's had a crush on this boy for years, a boy who her friends don't like, and he's finally starting to pay attention to her. It was unnecessary and I didn't really care for it. I’ll also keep this review spoiler free and be very vague for anyone who hasn’t read this book already! “Right Where You Left Me” was definitely not why I expected. The way the plot was described I thought it would be more of an adventure-thriller type novel. The actual book was more of a drama novel and didn’t have much action at all- though the book was still great! I related a lot to Charlotte’s relationship with her father in how close she is with him, and how much she cares for him, and her struggle connecting with her Mother as well. Charlotte and I have a lot in common from where we live, to our personalities, to our photography passion, and parent relationships; our similarities made this book especially enjoyable for me. The only thing that kept me from giving this book five stars was how the plot, at times, felt sort of unrealistic. Partially it was what the characters said and partially it was the story and thing happening. Overall this was a good read, and not too long either and I think it’s definitely worth reading. Charlotte is your average teen living in San Francisco with Russian immigrant mother Valentina and adventure-seeker father Jeremiah. Her father goes to the Ukraine to get footage of the devastating earthquake and, as a compassionate truth-seeking journalist, he feels compelled to write a story on it. But lo and behold, he goes missing. This book is about Charlotte's struggle to adjust to life without her father and her persistence in doing everything she can to bring him home, even if it goes ag Charlotte is your average teen living in San Francisco with Russian immigrant mother Valentina and adventure-seeker father Jeremiah. Her father goes to the Ukraine to get footage of the devastating earthquake and, as a compassionate truth-seeking journalist, he feels compelled to write a story on it. But lo and behold, he goes missing. This book is about Charlotte's struggle to adjust to life without her father and her persistence in doing everything she can to bring him home, even if it goes against the orders of the FBI. For the most part, I enjoyed this book and adored the deep and lyrical writing of Calla Devlin. She had an artistic way of telling the story through delicious Russian pastries and fascinating folklore. It's what kept the story interesting, otherwise it was a rather boring read. Although the story centred around the disappearance of Charlotte's father, there were elements to the story that didn't fit. The romantic interest for one. Charlotte clung to him like a kitten too afraid to jump into the water. Her desperate "need for him" was ridiculous. Emotionally, she needed his attention to make her feel better, so it only questioned why she was even with him at all if only for that. It felt like the story dragged a bit with these two and could've been better had the writer focused more on the sister-like friendship between Emma and Charlotte instead. Sadly, the ending fell flat. It seemed to go in the direction of how it should of ended, but ended in such an unsatisfying way it was frustrating. All in all, it was an okay book. However, I ADORE Calla Devlin's writing and it wasn't at all her ability to write a story that lost my interest, but the story itself. There was not much to run with. Because I now live in San Francisco, what initially caught my attention about this book was the stunning cover with the Golden Gate Bridge. And, while reading, one of my favorite things about it was the familiar details of the city. But in fact, the setting makes only one layer of the novel's atmospheric richness. Reading through Charlotte's lens, I enjoyed both her observations of the world and her inner reflections, which sometimes melded together. I particularly appreciated her portrait of he Because I now live in San Francisco, what initially caught my attention about this book was the stunning cover with the Golden Gate Bridge. And, while reading, one of my favorite things about it was the familiar details of the city. But in fact, the setting makes only one layer of the novel's atmospheric richness. Reading through Charlotte's lens, I enjoyed both her observations of the world and her inner reflections, which sometimes melded together. I particularly appreciated her portrait of her mother, the nostalgia she evoked in describing her mother's baking, the infusion of Russian folklore, and how she used that fiction to make sense of her life. Despite how charmed I was by the writing, I never got as invested in the story or characters as I wanted to be. This book tends to be more on the reflective side as Charlotte goes through the hardship of her journalist father being held captive by a Ukrainian rebel group after a natural disaster. However, while Charlotte's grief is the focus of much of this book, I don't know that it was ever as moving as the more nostalgic moments were. Charlotte's hardship is also spliced with her school life and her worries about transitioning to college. This meshing of two realms, and especially the very out-of-place romance, interrupted the more contemplative tone rather than balancing it. Perhaps it was the awkwardness of this that made a sub-300-page book seem to stretch a bit too long. That, added to a rather convenient ending, made me not connect with the book as much as I wanted to. Overall, while I think this book is heartfelt, I feel as though all the different aspects of this story never came together smoothly. And while some instances of beautiful writing stood out, the plot did not not equally hold my attention. Ms. Devlin is a master at writing novels with intricate and challenging family dynamics, overlapping layers of intrigue and suspense, gut wrenching twists and turns that pull the reader in and engage them right up till the very end of the story. Right Where You Left Me starts out so lovingly that you know that something just has to collapse and it soon does. The trauma of this family crisis becomes more intense as the story progresses. In addition, the author's portrayal of Charlotte and her Mot Ms. Devlin is a master at writing novels with intricate and challenging family dynamics, overlapping layers of intrigue and suspense, gut wrenching twists and turns that pull the reader in and engage them right up till the very end of the story. Right Where You Left Me starts out so lovingly that you know that something just has to collapse and it soon does. The trauma of this family crisis becomes more intense as the story progresses. In addition, the author's portrayal of Charlotte and her Mother's relationship as well as their Russian roots really enhances this hauntingly beautiful story. I loved reading every page of this book! The intricacies of the plot, the cast of well developed characters and the experience of a budding young love amidst a tragic family event just grabbed my heart and wouldn't let go. The narrator of this young adult novel is Charlotte, a teenage photography buff who lives in San Francisco with her parents. Her dad is a journalist who flies around the globe to report the human angle of disasters. Her Russian mom, a baker, is quiet and detached. When Charlotte's dad disappears in Ukraine while covering the aftermath of an devastating earthquake, she's frightened but tries to keep positive. Then the FBI steps in and tells Charlotte that any attempt by her, her friends, or famil The narrator of this young adult novel is Charlotte, a teenage photography buff who lives in San Francisco with her parents. Her dad is a journalist who flies around the globe to report the human angle of disasters. Her Russian mom, a baker, is quiet and detached. When Charlotte's dad disappears in Ukraine while covering the aftermath of an devastating earthquake, she's frightened but tries to keep positive. Then the FBI steps in and tells Charlotte that any attempt by her, her friends, or family to free her dad will be considered treason. On the one hand there's a lot to like--it's a one shot, Devlin does a really great job of making the father's absence its' own character, there's some really great imagery in here. On the other hand, I feel like this wrapped up too quickly and nicely, and it's a very internally driven book. It's not bad! I don't know that I need to revisit this ever, but for a short listen I liked it. I could feel the struggle and the feelings of Charlotte and her family just through the thin pages and the text. The suspense was killing me in the end. I really liked this book. It had fast rising action and a nice climax. I wish we had gotten a good epilogue though, because it would have wrapped up the whole story very nicely. Throughout this story, Devlin expertly crafts a story filled with heartbreak, grief Calla Devlin’s sophomore novel offers a look into what happens to those left behind after disaster. Calla Devlin is the author of Tell Me Something Real, a finalist for the PEN Literary Award, finalist for the William C. Morris Debut Award, and International Literacy Literary Award Honor, and Right Where You Left Me. A Pushcart nominee and winner of the Best of Blood and Thunder Award, her stories have been included in numerous literary journals and anthologies.